But have you ever considered the amount of work that goes into that plate of food? No doubt there is some seed planting, plant tending, and harvesting involved, but did you know there’s even more involved than that? The work involved getting that food on your fork extends beyond just the growing, harvest, and cooking, but also includes a lot of planning and ancillary things like marketing and social media work. An example of the extensive work involved to plate local food at a restaurant can be found at Millworks, a relatively new local food restaurant/brewpub located in Midtown Harrisburg. Millworks patrons can visit the art gallery/studio and not only check out the artwork, but also talk to the artists if they happen to be there. 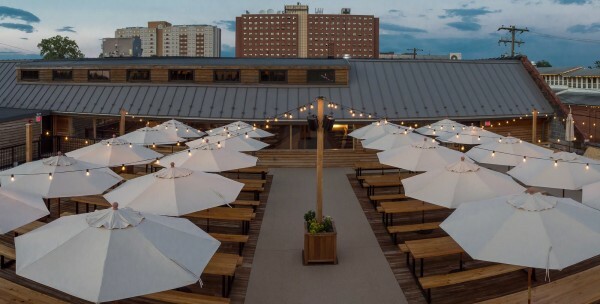 The building itself was a wood millwork factory, hence the name, and has an interesting local food connection via its location, next to the oldest continually operated farmers market in the country, the Broadstreet Market. The first step of getting those tasty locally produced morsels to your fork involves planning. While it may seem like it could be as simple as checking with the farmer to see what is seasonal at the moment, other factors have to be considered. This often involves some research. Kesler and other locally focused restaurant owners will pay a visit to the farm. “What we do if we find a new producer is we’ll talk to them, visit the farm, and find out what methodology they use to grow,” he said. One such farm is Chester Stoltzfus’s farm, Wholesome Living Acres, located in the rolling hills near Lykens, PA. The farm is certified organic, and if you’ve ever had an egg-based brunch item at Millworks, they came from his free-range hens. Stoltzfus doesn’t just raise chickens and grow vegetables for Millworks, he works with Millworks to plan what he will grow for them. “We sit down with the Millworks chef (Lance Smith, Millworks executive chef) at the beginning of the year before planting and talk about what we have in perennial crops (such as strawberries and asparagus) and what he’d like to see us grow in annual crops,” Stoltzfus said. Wholesome Living Acres, Stoltzfus said, used to be a larger operation that did wholesale vegetables but he scaled it back to do retail vegetables and supply for restaurants. To call Wholesome Living Acres a family farm would be quite accurate; the extensive work at the farm is done by four family members. It’s a year-round operation, and this year his farm produced fruits and vegetables such as asparagus, blackberries, raspberries, strawberries, tomatoes, and peppers. He said that the work involves planting, weeding, pest control, and remaining ever-vigilant for pitfalls such as plant diseases and garden pests. Then, he noted, there’s a lot of work involved with harvesting, not just picking the vegetables but ensuring they are packaged properly for delivery. A few of the crops, such as onions and other root vegetables, need to be set into storage. Stoltzfus said he doesn’t have the best storage facilities but they have these types of vegetables on hand for delivery into the fall. He said the produce work will include mixed greens this year, and that they have a number of greenhouses and high tunnels for this work. And of course, there’s also the care for all those free-range chickens that make for some tasty egg dishes. “They have a unique menu, and they certainly keep us busy, that’s for sure,” Stoltzfus said. Along with fresh produce and eggs, Millworks also locally source meat and fish. This includes seafood from the Chesapeake Bay, which has a long history of providing southern Pennsylvania with fresh fish and other seafood. Limestone Springs employs 12 people, according to Mark E. Ely, owner of Limestone Springs. Ely said that the facility is split into different areas. This includes a main farm where they raise the fish, a fish-for-a-fee fishing stream, and a processing room. The fishery receives a shipment of 2-3” fingerlings four times a year. The fish are three months old when they arrive, and are put into raceways at the farm filled with spring water from an old limestone quarry. They feed the fish Skretting feed from Utah, which is a high-quality fish food, Ely said. The Limestone Springs crew care for the fish over their time at Limestone Springs. It takes on average 16 months for the trout to reach 14”, but Ely said trout are available anytime. They also do other processing including whole fish and fillets. They process roughly 3000 pounds of fish a week. “We’re the largest commercial trout farm in PA and the only one that I know of that processes fish,” Ely said. As for that planning process, Kelser said it’s a small group who does it. He said the team that creates the menu is his wife, Rachael, Smith, the executive chef and himself. “My wife and I are just foodies at heart,” he said. They come up with innovative ways to market via partnerships. Kesler said anytime they visit a farm for any reason, they make sure good photos are taken and they share it with the farmer so those photos can be shared on the farm’s website and social media. That way they can do cross promotion. The rest of the restaurant staff such as the wait crew, Kelser said, have full buy-in on Millworks’ mission and what they want to do. “We don’t have to convince many people to come to work, they love what they do and they enjoy learning about what it is what we’re doing,” Kelser said.